Through your dog's respiratory function of their nose they release keratin which is the same building block of their nails and fur. The amount of keratin release is different for every dog but over time it results in a scaling and scab like deposit on your dog's nose. 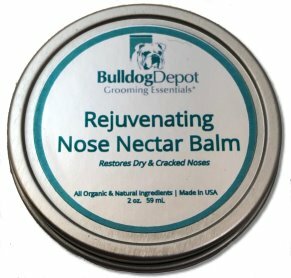 We know the condition well given our experience with English Bulldogs and we have developed our own propriety product to remediate excess keratin buildup- Bulldog Depot Select Nose Nectar. Apply daily for 5 days and the scaling will soften so you can gently assist removal by picking scales off revealing a beautiful rejuvenated nose. Available in 3 sizes. Order yours today!